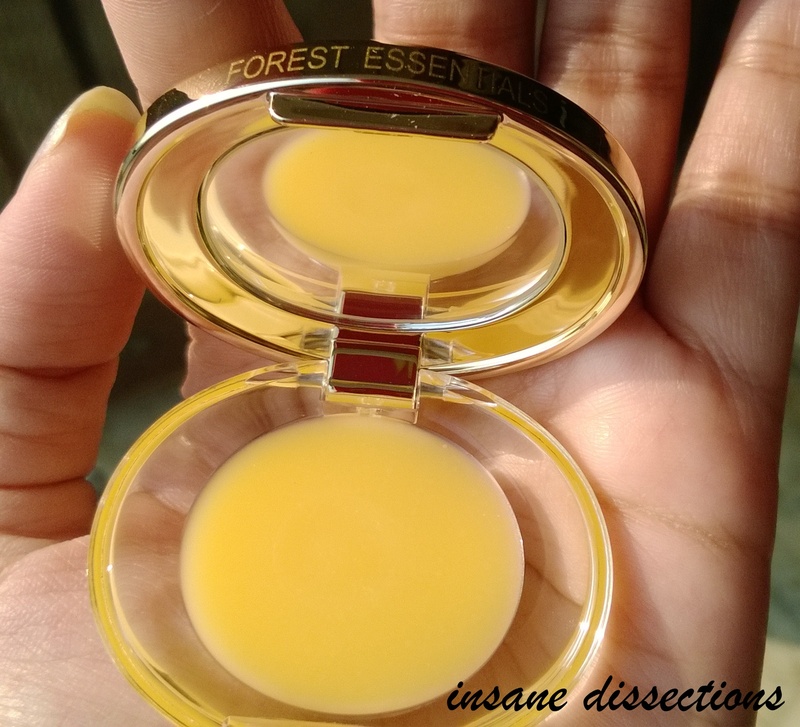 So Shea Butter & Pomegranate Lip cream is one of the latest launches from Forest Essentials, and since their lip balms is my absolute absolute favorite (Reviewed HERE), I HAD to try this lip cream. Read on to know how it fared. Unlike their lip balm, this product is marketed as Lip ‘Cream’ and so comes in a different packing than the lip balm. It comes in a white and silver tube packaging with attractive floral art. The applicator is the slanted tip with hole to dispense product (much like the original Vaseline/ Himalaya lip balms). The applicator part is covered with a black screw cap. The back contains all the product details. Also unlike the lip balm, it does not come in additional cardboard packaging. Texture is exactly what the name suggests- creamy. Being a cream it has more slip on the lips than the usual balms and may feel a bit off at the starting especially if you apply more than required quantity, since we are accustomed to applying waxy lip balms. But after sometime the lip cream absorbs nicely and feels more comfortable. Forest Essentials Shea Butter & Pomegranate Lip Cream does its job well. It makes lips soft and supple and heals chapped bits. Forest Essentials is a heaven for amazing smelling products. But surprisingly, this lip cream smells too sweet and artificial for my liking. I was expecting some hints of pomegranate or any other natural fragrance, but the smell disappointed me! It stays for 3-4 hours easily. The quantity is much more than the lip balms (10 g vs 4 g), and only a teeny tiny amount is needed for 1 application. So this product will last a fairly long time. 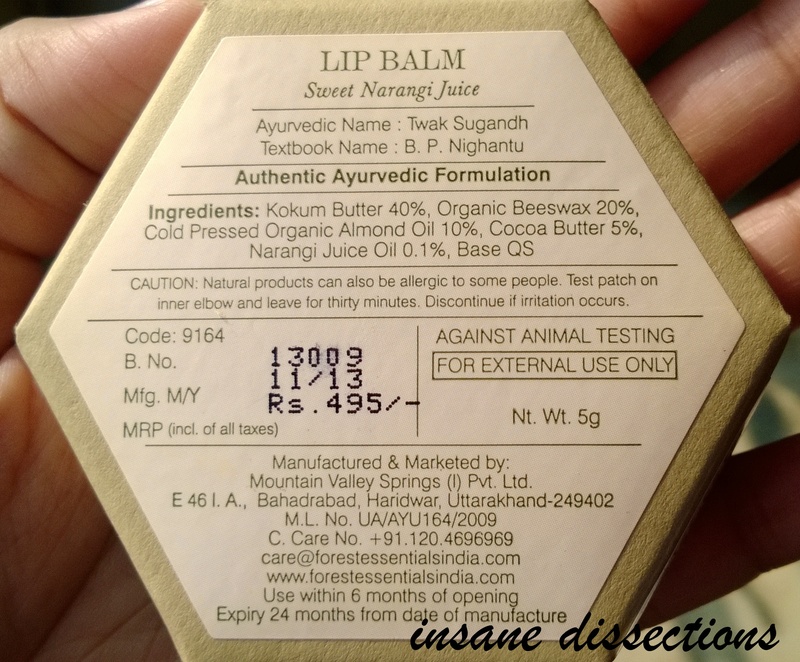 It is still bit expensive for a lip balm/cream , but this is what is expected from Forest Essentials, as after all it is ‘Luxurious’ Ayurveda, right? Overall, Shea Butter & pomegranate Lip cream is just okay and does its job fine. It is not a lip balm but a cream so do not expect same texture as the balm. It has more slip at the starting but settles down to comfortable finish after sometime. It does its job nicely, makes lips soft and supple. However, the smell is off putting and feels too sweet, artificial and strong for my liking. As compared to the lip balm, it has more quantity and lasts longer. Only a little quantity is needed for one application. 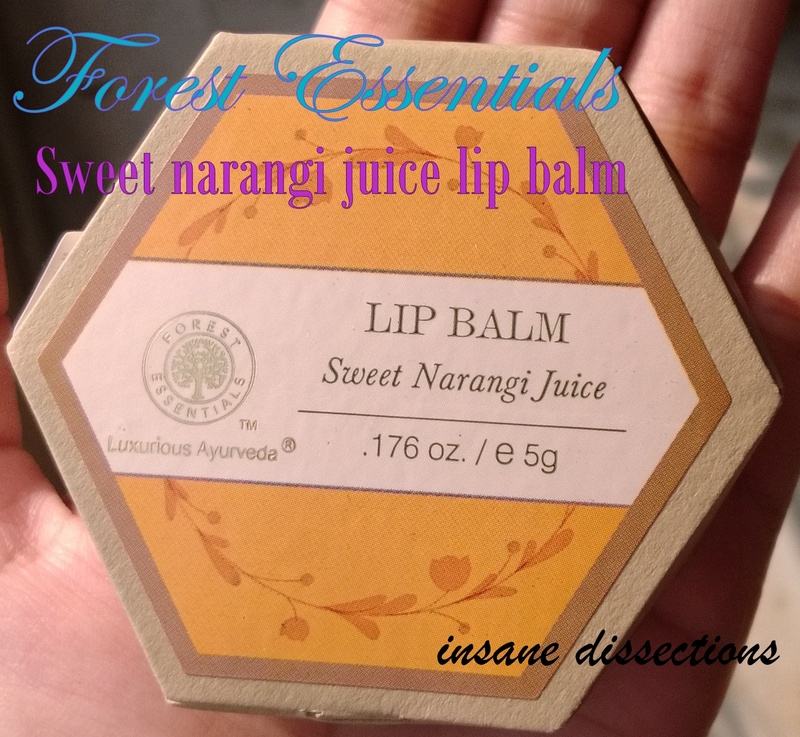 But I will still stick to my fav lip balm FE Sweet Narangi Juice, and probably will not repurchase this lip cream. Tinted lip balms have always been my thing. Even after my marriage, I don’t apply lipsticks daily. I always go for tinted lip balms. Whenever there is a new tinted balm in market, I HAVE to try it. Maybelline has always been a favorite for their Baby lips ever since they first launched the tinted variant. They have recently introduced Candy Wow Baby Lips and I was quite excited to try these. I have 3 shades with me- Orange, Cherry and Mixed Berry. Cherry: Semi sheer cherry red color, most pigmented of the lot, leaves a beautiful stain, will suit every skin tone. These lip balm come in brightly colored twist up crayon packaging. The color of the tube is matched with the color of the lip balm so it is easier to identify. The fonts on the Lip balm tube are ultra cute. It is a chubby lip balm with retractable, rounded tip. The cap is not very tight but so far I have had no issue of them coming off while travelling. The lip balms have very smooth and buttery consistency. They are moisturizing, highly glossy with good color pay-off. They are like sheer lipsticks, only a notch higher on the moisturizing front. The color is sheer which can be intensified by applying 2-3 coats. They leave a mild stain on the lips which intensifies when you reapply the lip balm, especially Cherry flavor. They are not super moisturizing and won’t heal your chapped lips magically overnight. But these are amazing for daily wear if you want a hint of color on your lips. The wear time is about 2-2.5 hours on my lips, after which I need to reapply the lip balm. The fragrance is amazing and not over powering. They have individual fragrance based to the shade name. One thing I don’t like is the quantity. They have reduced the quantity and increased the price. Also, I feel the lip balm ‘melts’ inside the tube especially in hot weather as one can see messiness on the crayon stick and also it shifts side ways while you twist it up. So, I don’t twist it up all the way when this happens as it may break. You can see the ‘melting’ of the stick in the pics below. For one thing, I keep ‘orange-y’ things at bay- be it a flavor in food or a fragrance. I don’t know why. The Orange candies we used to eat when we were kids, yeah I hated it. Rasna Orange? No thanks. Although I’m a big fan of this color in fashion/beauty. Now Narangi is the elder sister of orange. When I went to the store and sniffed this balm, one word describes it- AMAZING. Now you see, you enter Forest Essentials store, it is already a heaven for your olfactory senses. But more than the smell, the USP of this product lies in its packaging. Classy is the word. I am a sucker for cute packaging. In fact, there were two variants- one without the mirror (which was cheaper btw), they called it ‘for men’ and another one which I bought-‘for women’. I asked the SA about the difference in quality or quantity, there was no difference whatsoever. Only the mirror makes it “feminine”. But now the variant without the mirror has been discontinued. Okay so I’ll talk about the different aspects one by one. True to its name. Sweet narangi. The fragrance is not overpowering. It fades after about 1 hour. 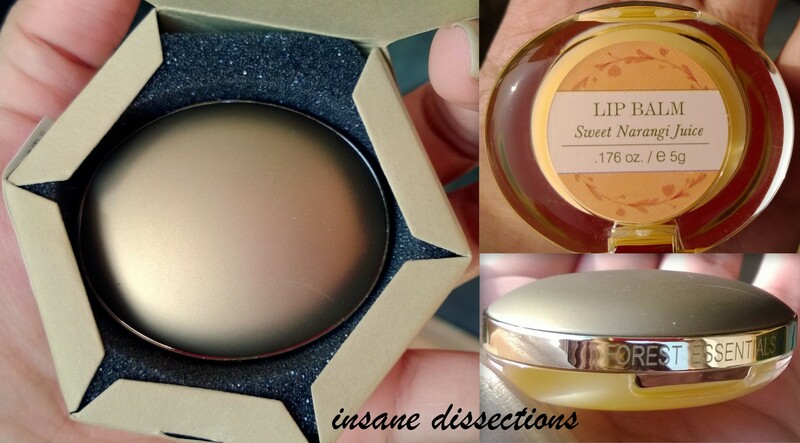 Super gorgeous, super classy packaging.It comes in a hexagonal cardboard box with black foam inside which holds the lip balm snugly. It has an in-built mirror like there is in blushes, compacts etc. Really helpful when you’re on the go. Plus the sleek packaging makes sure it fits in your purse or jeans pocket. Only gripe is that since it is a tub packaging, you have to take it out using your fingers. Some may find it unhygienic but it works for me. I scrape it out with my nail and then apply it. 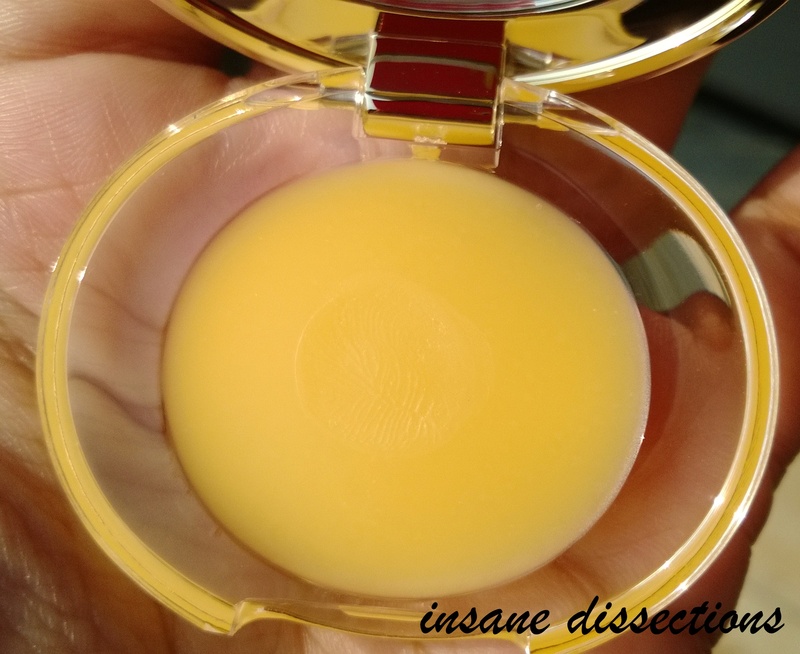 The lip balm is yellow in pan but colorless when applied. This is the lightest lip balm my lips have ever touched.The consistency is like ghee, but much better. Unlike the waxy lip balms (the likes of Vaseline), this lip balm is feathery light. You apply it and after sometime you forget you applied something. It doesn’t feel heavy AT ALL. It instantly makes the lips super soft and leaves a glossy finish. It fades after around 2 hours on my lips. I don’t have chapped lips so I cannot comment on that. Now the main reason I picked this cute piece of pricey balm is that it works on Lip Pigmentation. Yes. My lips got pigmented after I used Maybelline Color bloom for a couple of weeks. I don’t use lipsticks or lip gloss, so I’m not talking heavy pigmentation. But whatever moderate pigmentation I had, this baby is taking care of it. The other variant which is now discontinued in stores was for Rs. 375. I think they have hiked the price now. Their online site is showing Rs. 595.